Rebuilding the partnership between America and its colleges & universities. There is a growing sense of crisis and confusion about the purpose and sustainability of higher education in the United States. In the midst of this turmoil, students are frequently referred to as customers and faculty as employees, educational outcomes are increasingly measured in terms of hiring and salary metrics for graduates, and programs are assessed as profit and loss centers. Despite efforts to integrate business-oriented thinking and implement new forms of accountability in colleges and universities, Americans from all backgrounds are losing confidence in the nation's institutions of higher learning, and these institutions must increasingly confront what has proven to be an unsustainable business model. In Our Higher Calling, Holden Thorp and Buck Goldstein draw on interviews with higher education thought leaders and their own experience, inside and outside the academy, to address these problems head on, articulating the challenges facing higher education and describing in pragmatic terms what can and cannot change--and what should and should not change. They argue that those with a stake in higher education must first understand a fundamental compact that has long been at the heart of the American system: a partnership wherein colleges and universities support the development of an educated and skilled citizenry and create new knowledge in exchange for stable public investment and a strong degree of autonomy to pursue research without undue external pressure. By outlining ways to restore this partnership, Thorp and Goldstein endeavor to start a conversation that paves the way for a solution to one of the country's most pressing problems. Our Higher Calling is scheduled to be released in September, 2018 with pre-ordering available now on UNC Press. Holden Thorp, Ph. D, is a career university educator, administrator, researcher, and author. He is also an accomplished musician, preferring the bass. Holden is the Provost of Washington University, holds degrees from the University of North Carolina Chapel Hill, California Institute of Technology, and Yale University. He has two children in college, and he lives with his wife Patti in St. Louis, MO. Buck Goldstein is a lawyer by training, and has been involved in entrepreneurial activities for most of his professional life. He founded the Shuford Entrepreneurship Program at the University of North Carolina where he continues to teach. He and his wife Kay live in Chapel Hill, N.C. and Martha’s Vineyard, MA. They have two grown children. American higher education has long enjoyed intricate partnerships with government and society, but in recent decades, those have frayed. Thorp and Goldstein offer penetrating insights about the challenges faced as well as a comprehensive prescription for a new and enduring compact. For more than a century, a strong system of American higher education has been one of the greatest drivers for prosperity, not just in our own country but in the world. This thought-provoking book shows that our future depends on restoring a common understanding of the purpose of higher education. 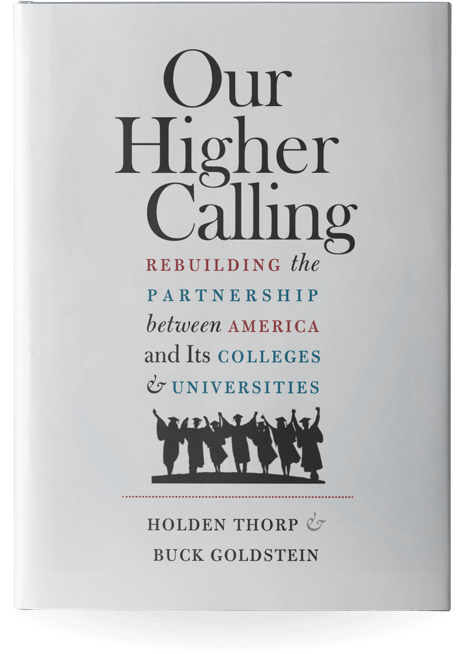 With a clear-eyed sense of challenges and failings in our colleges and universities, Thorp and Goldstein also show the elements of meaningful strategies to address demographic, technological, and other changes.